For general enquiries, contact us on (03) 9988 4950. Our mailing address is PO Box 1763, Preston South, VIC, 3072, Australia. 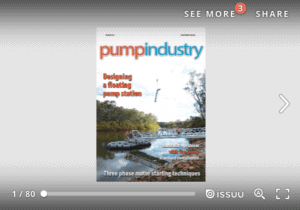 To submit a press release, or to let us know about a story, email us at magazine@pumpindustry.com.au. Information on advertising in Pump Industry can be found in our Media Kit. For queries relating to your Pump Industry subscription, call (03) 9988 4950 or email subscribe@pumpindustry.com.au.